District 214 has introduced a new scholarship opportunity for current seniors. 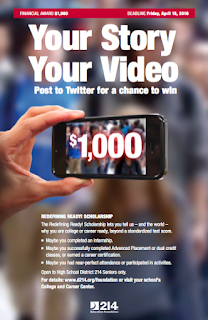 The District 214 Foundation is offering a $1,000 Redefining Ready Scholarship in a new and exciting format: a video! For students to apply for this scholarship, they are to submit a 30-second video on how they found their career path and post it to Twitter with the hastag #redefiningready. We, Kim and Rachel, got involved in this project when the teacher of the Teacher Internship Class asked us to step in to show multiple apps for students to use to create these videos. The apps included Adobe Voice, Explain Everything, Educreations, and ShowMe. We showed students how the apps worked and what videos from the apps looked like and then discussed with them the pros and cons of each based on what they wanted to accomplish with their project. As soon as I heard about the #RedefiningReady Scholarship, I wasn't so sure, if I would want to record myself, because I am not a good speaker when it comes to recording myself, or me being recorded with a device. Then when I found out I have 2 of my classes that are giving us an opportunity to work on the Scholarship in class, I was starting to consider working on it. The next step was finding an app that I could use for the recording, which was not hard at all. I already had iMovie on my ipad for a previous class project. I then had to start writing a script and find pictures and music of what I wanted to say in the scholarship that shows that I am Redefining Ready. I changed my mind on what I wanted to talk about so many times! Once I got my script written out, I asked my brother to help me record myself [but he didn't, so] I had to figure out how to use voice over on imovie. It took me about 26 tries to get the right video that I wanted. i enjoyed making this Scholarship. I learned many new skills that I have never knew how to use them. I encourage all seniors this year and in the near future to take this opportunity. More information about the scholarship can be found here.